Shop fun and delicious birthday gifts! 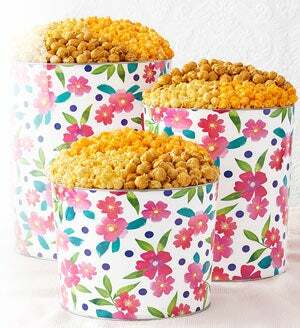 You'll find birthday snacks and treats, perfect for any birthday party, presented in festive tins and gift boxes. 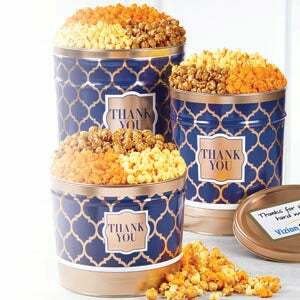 From classic flavors to birthdy cake popcorn, our gourmet birthday popcorn gifts are a great way to wish someone well on their special day! Birthday celebrations are all about the cake–but sometimes change is good! 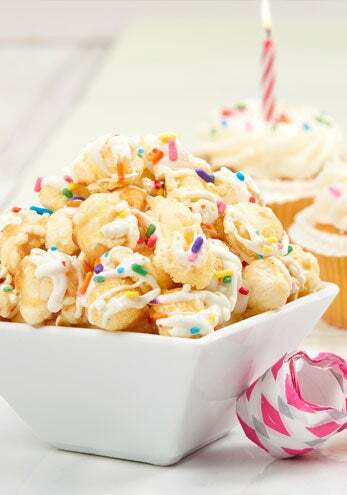 Birthday cake popcorn is the perfect combination of salty and sweet. Plus, what’s a birthday without an extra dose of rainbow sprinkles? Learn how you can make your own birthday cake popcorn whether it replaces your birthday cake or is an addition to it (we won't tell!). Spread your popcorn out on a baking sheet lined with parchment paper. Microwave the white chocolate in 20 second intervals, stirring in between each interval. Microwave until completely melted. Add cake batter and 1/3 cup rainbow sprinkles into the melted chocolate and mix. 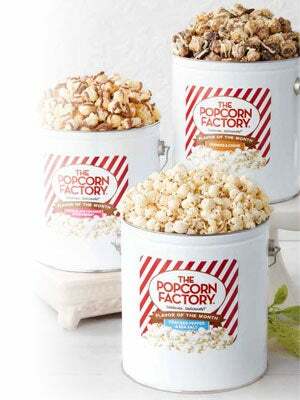 Drizzle the white chocolate mixture on top of the popcorn using a fork or spoon. 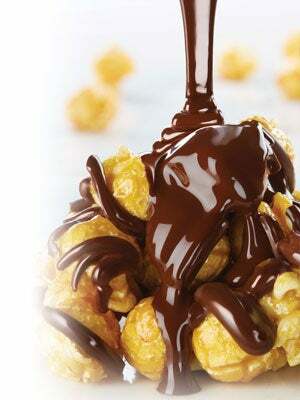 If the batter is too thick to drizzle mix the popcorn using a spoon or your hands until the chocolate is evenly coated. Sprinkle the extra 2 tbs of rainbow sprinkles on top of the popcorn. Enjoy!